SPECIAL OFFER: Book 2019 Tickets Today and Pay 2018 Prices! Nowhere else in the world can you explore like an astronaut and experience first-hand the awe-inspiring NASA story. The Kennedy Space Centre Admission Ticket gives you access to all the fascinating experiences the Kennedy Space Centre Visitor Complex has to offer including a bus tour of the Kennedy Space Center Restricted Areas to explore the Saturn V Center. At the Rocket Garden you can climb-aboard Mercury, Gemini and Apollo capsule replicas and view the monstrous 111-meter Saturn V moon rocket, the most powerful rocket ever built. 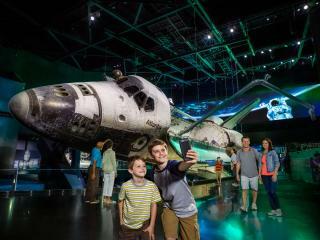 Admission also includes 2 IMAX 3-D films, the Shuttle Launch Experience and the amazing Space Shuttle Atlantis. The exhibit showcases Atlantis as if it were in space, raised 30 feet off the ground and rotated 43 degrees and also tells the compelling story of the entire shuttle program. More than 60 interactive, immersive exhibits and simulators provide guests a never-before experienced perspective on the shuttle’s complex systems, components and capabilities. On the Shuttle Launch Experience*, visitors strap in to the sights, sounds and sensations of a real Space Shuttle launch. In two giant IMAX theatres, the dream of spaceflight comes alive with a wall of sound, a five-story screen and realistic 3-D special effects. Kennedy Space Center Visitors Complex is a 45-60 minute drive east from Orlando on Florida’s Space Coast. You will be sent an open-dated Kennedy Space Center Admission Ticket which can be used at any time during the calendar year. Transportation is NOT included to and from Kennedy Space Center. Please see the Kennedy Space Center with Transportation Ticket should you require transportation from Orlando.